Say goodnight to midnight changes with HUGGIES OverNites Diapers. These disposable diapers for nighttime are custom designed for sleep. The most absorbent HUGGIES diapers, OverNites have Double Leak Guard for up to 12 hours of protection, a SnugFit waistband with Double Grip Strips for a secure fit, plus a wetness indicator that changes color when it’s time for a diaper change. An embossed inner liner and breathable outer cover work together to lock away wetness for a drier, more comfortable night for baby. 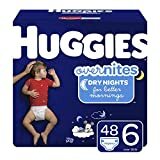 HUGGIES overnight diapers are the #1 Selling Nighttime Diaper (based on nighttime diaper category sales) and are available in sizes 3 to 6 for babies and toddlers 16 to 35+ pounds.